CSKA Moscow sent a message throughout the Euroleague with a 100-65 thrashing of Maccabi Electra Tel Aviv at Universal Sports Hall on Friday night in the Russian capital. Milos Teodosic shined with 22 points and 8 assists and Victor Khryapa flirted with a triple double – 10 points, 10 rebounds and 8 assists – as the Russian champs retained at least a share of first place in Group F with a 6-1 record at the midway point of the Top 16. Maccabi, 5-2, will be no worse than third at the end of the round. The loss was the second worst in Maccabi’s illustrious Euroleague history only to a 125-78 drubbing at the hands of Real Madrid in January 1976. CSKA not only outrebounded Maccabi 38-27, but had more than double its assists (27-12) and outshot the visitors on two-pointers (58.1%-53.8%), three-pointers (63.6%-32%) and free throws (88.9%-81.3%). Maccabi kept it close in the first half and trailed by just 7 at the break, but CSKA dominated the second half 53-25 to chalk up an impressive win. Sonny Weems added 16 points, Nenad Krstic – who was awarded his January bwin MVP trophy before the game – scored 14, Sasha Kaun 12 and Aaron Jackson contributed 11 in 12 minutes off the bench. 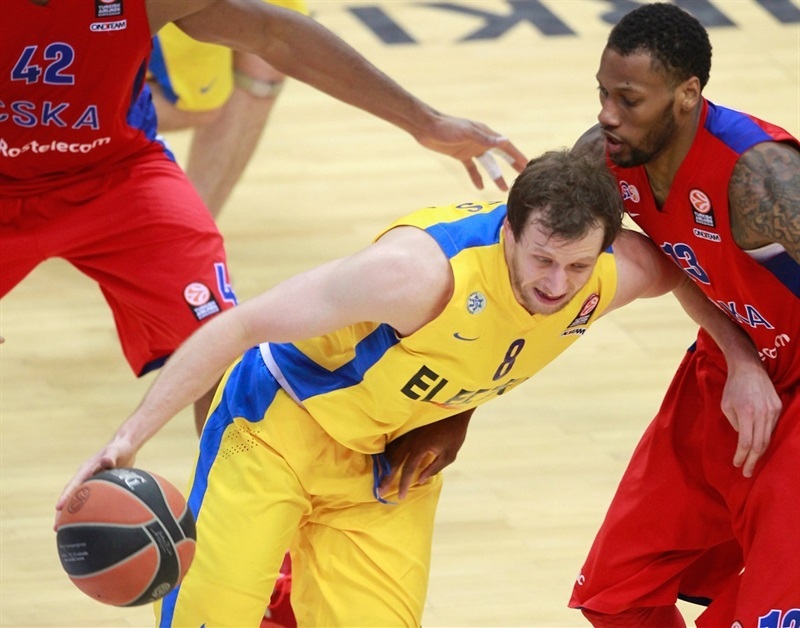 Joe Ingles paced Maccabi with 13 points, 6 rebounds and 6 assists, Sofoklis Schortsanitis scored 12 and Guy Pnini 11. 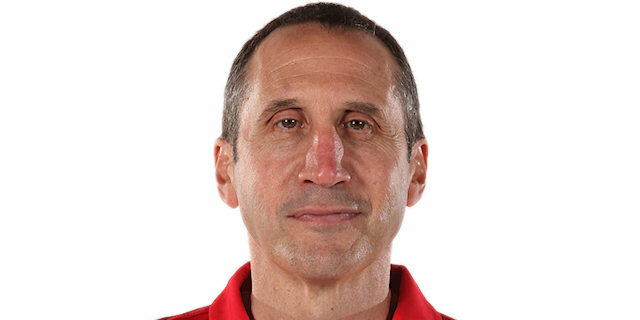 Before the game, Maccabi coach David Blatt was honored by the Russian Federation with the nation’s Order of Friendship for his time and success leading the Russian national basketball team. Former Deputy Prime Minister Sergei Ivanov pinned the award to Blatt’s jacket. Maccabi struck first with a pretty pass from Ingles to a cutting Schortsanitis. 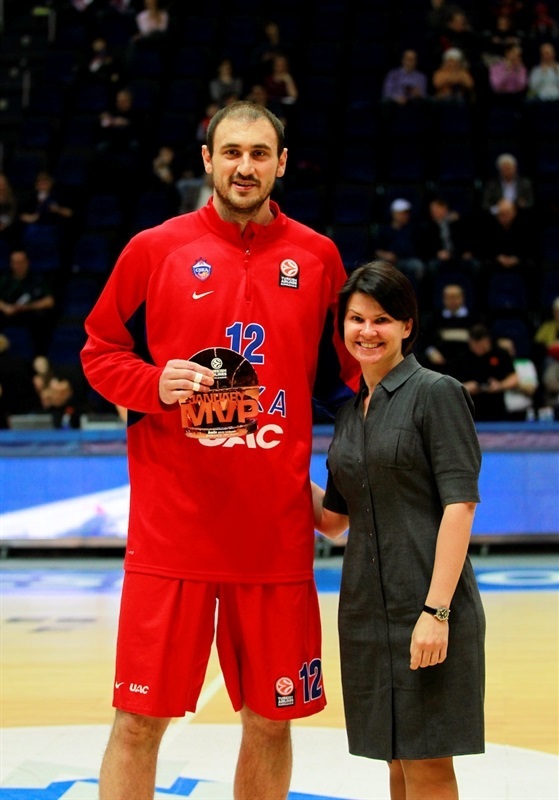 Khryapa got CSKA going with a jumper. Joe Ingles pulled up for a triple and a 2-5 Maccabi lead. Kyle Hines rejected Sofo at the rim and Teodosic scored twice to give the hosts their first lead. Pnini sank a triple before Hines offensive rebound and score tied it. 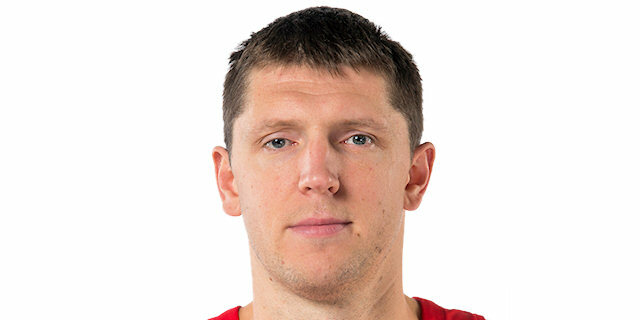 Ingles and Pnini each connected on their second threes, however CSKA continued to go inside, where Krstic scored and drew fouls on consecutive possessions. 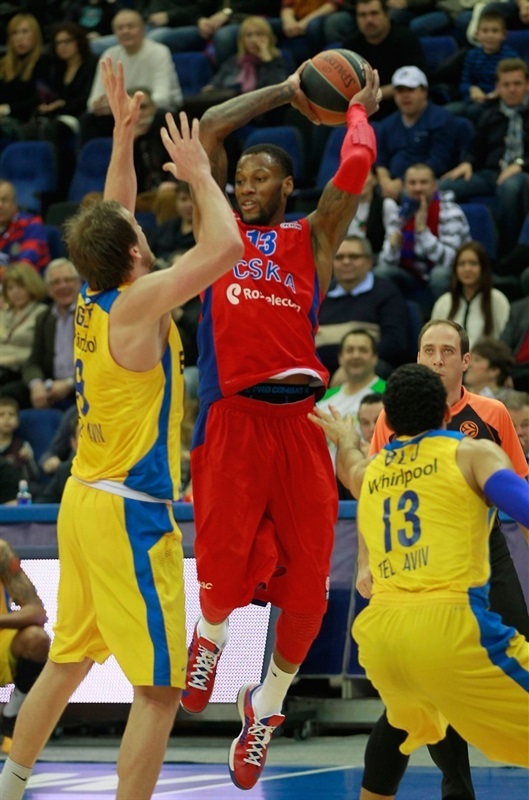 Sonny Weems tied it at 14-14 on a pull-up jumper midway through the quarter. After the TV timeout, CSKA went ahead on a Teodosic three. Tyrese Rice used his speed to generate 4 quick points before Teodosic fed Kaun for a slam to make it 19-18. Ingles missed an uncontested layup after a steal and Kaun contorted himself for another bucket before Teodosic doubled the CSKA lead with a triple. David Blu responded from downtown, but Kaun netted a hook shot to make it 26-21 through 10 minutes. Kaun scored again and Khryapa drained a three before Vitaly Fridzon finished a break with a layup as the hosts soared to 33-21. After a Maccabi timeout, Fridzon dished to Kaun for a two-handed jam as the run reached 11 unanswered points. 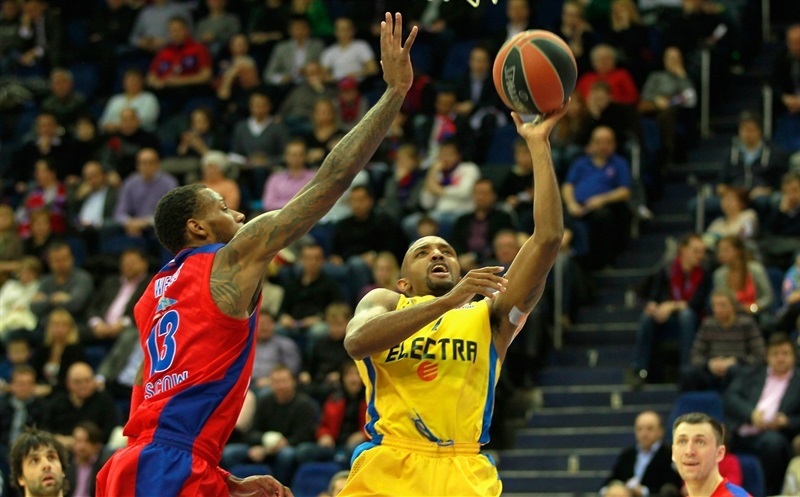 A Ricky Hickman free throw ended Maccabi’s scoreless run at four minutes. Krstic added a long jumper to make it 39-24. 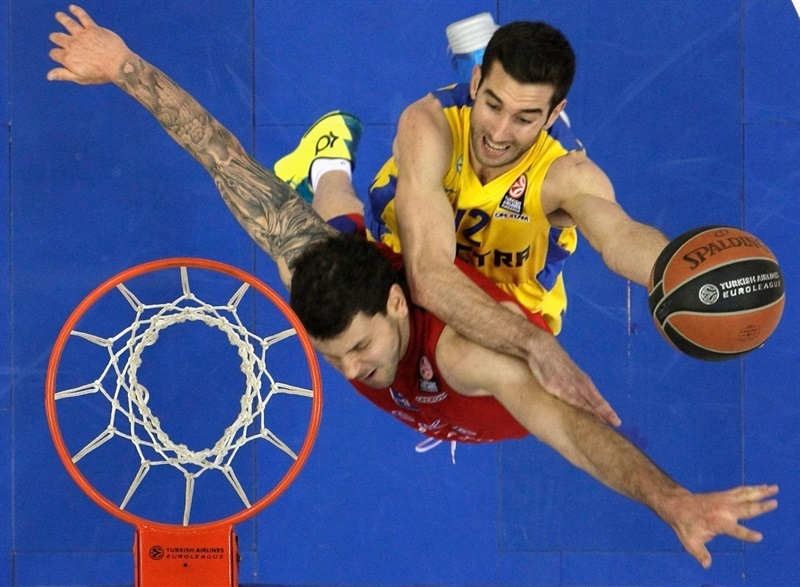 Schortsanitis and Krstic traded baskets against one another. Hickman free throws and a Yogev Ohayon steal and layup closed the gap. Schortsanitis scored again in the paint to cap a 0-6 spurt. Hines and Sofo swapped free throws before Pnini netted his third triple to bring Maccabi within 41-35. Teodosic nailed a three on the ensuing possession. Schortsanitis took a seat with 3 fouls, but Hickman penetrated for a basket-plus-foul. Then Weems sank a three before Hickman got to the line and trimmed the gap to 47-40 at the break. Maccabi went inside for Schortsanitis for the first basket of the second half. CSKA stuck with its game plan and reeled off points from Hines at the line and Weems on the break before a Krstic jumper restored CSKA’s double-digit lead. Krstic’s next bucket in the paint made it 55-42 midway through the quarter. Ohayon cut for a tough layup to end a four-minute scoring drought for the visitors. Khryapa took advantage of space to drain an open three. Pnini and Hines scored inside on either side of a timeout. 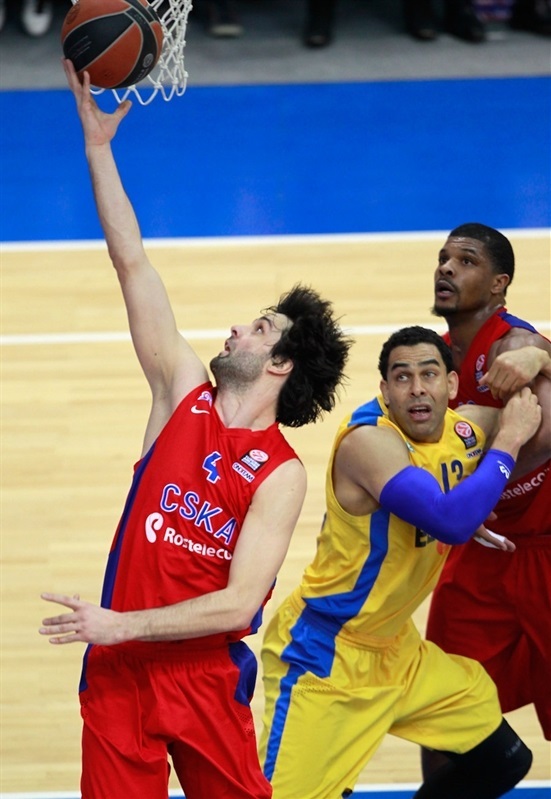 Then Rice and Teodosic swapped penetration layups. 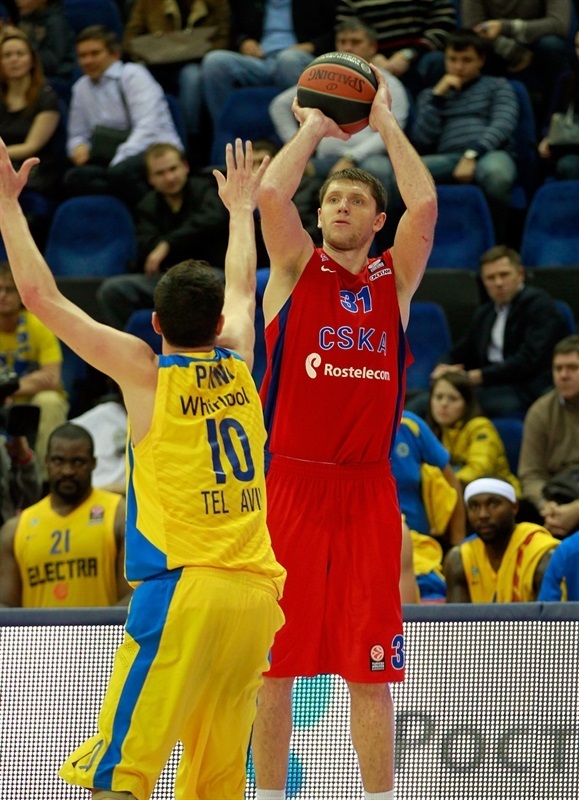 The CSKA lead reached a new high on a Kaun basket in transition, 64-48. Sofo and Khryapa traded baskets. Ingles scored a tough layup. However a cross-court Teodosic assist to Jackson for a triple left CSKA ahead 71-52. Ingles began the quarter with his third three. Jackson countered from downtown before Rice drew a foul shooting a three and sank the ensuing free throws. 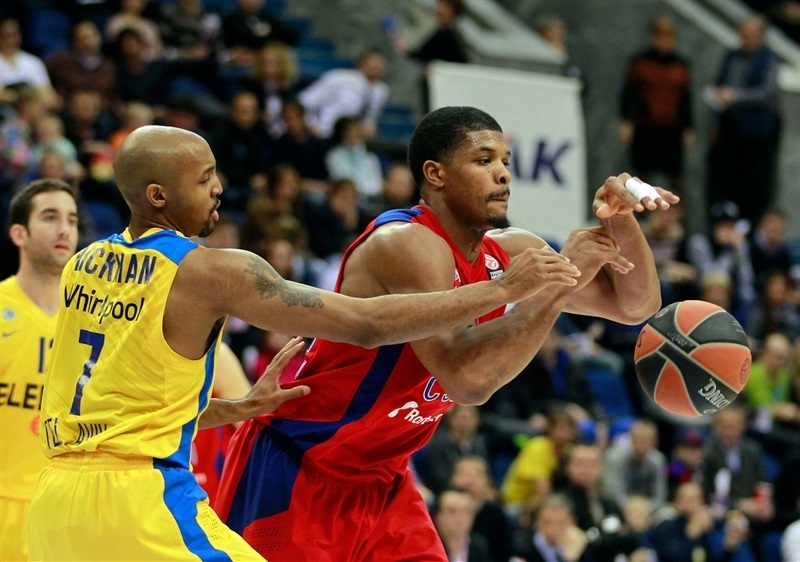 Jackson remained hot and buried a three and a two to give CSKA a 20-point lead. Ingles tossed Sylven Landesberg an alley-oop layup off an inbounds play. Ingles added another basket. Weems and Landesberg traded threes. Khryapa cemented his double-double with a rebound before the lead reached 25 on back-to-back Weems triples. Khryapa got his eighth assist on a pass to Fridzon, who was fouled in unsportsmanlike fashion by Blu. 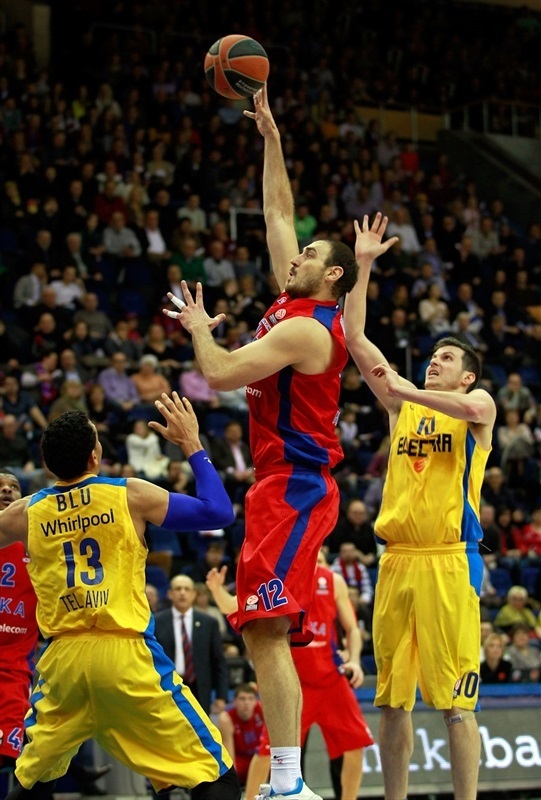 Fridzon added a three and Teodosic scored 5 in the last 10 seconds to complete a rout. "We should not forget that Maccabi missed several players, especially [Devin] Smith and [Alex] Tyus. Still it is a great win for us. Big part of credit goes to my assistants Dan [Shamir] and Dima [Shakulin] as well as Benas [Matkevicius]. Dan and Dima worked under Coach Blatt and they know well his system, which is actually a difficult system to play against. So these preparations were very important. Definitely I’d like to say that our players acted wonderfully. Except for obvious talent, they showed desire, effort, aggressiveness, toughness. I wish all of us would stay humble, remember that the road to the Final Four is long and difficult. Hopefully we gained confidence and desire to follow the same path." "Congratulations to Coach Messina and his players. CSKA played great game. Without question they were far better than us tonight. Regardless of certain circumstances – and we missed four players from our regular rotation – CSKA was better, and I don’t use our injuries as an excuse. Still I can mention that with a full roster we possessed the same record, so I think that actually we are not that bad as we were tonight." "It definitely was not an easy game for us. We spent much energy during practices and in the game. Until you meet your rival face to face it is difficult to understand what kind of basketball he plays. Maccabi has an original and special style not like other teams. They change their defense three or four times during the game. All Army Men who came today did a great job on defense." "It was a tough loss for us, we did play underhanded. And you know playing against a team like CSKA – a very big and talented team – is a tough task. One of the main reasons of the loss is they shot 14 of 22 three-pointers. So they made a lot of shots. In the second half we did not execute on offense as we would like to. But again, in the end they made a lot of shots." Before the game, Maccabi coach David Blatt was honored by the Russian Federation with the nation's Order of Friendship for his time and success leading the Russian national basketball team. 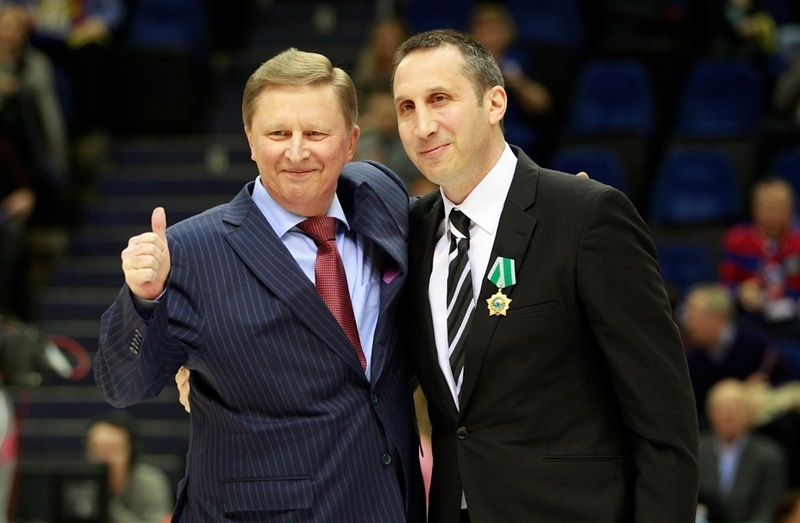 Former Deputy Prime Minister Sergei Ivanov pinned the award to Blatt's jacket.